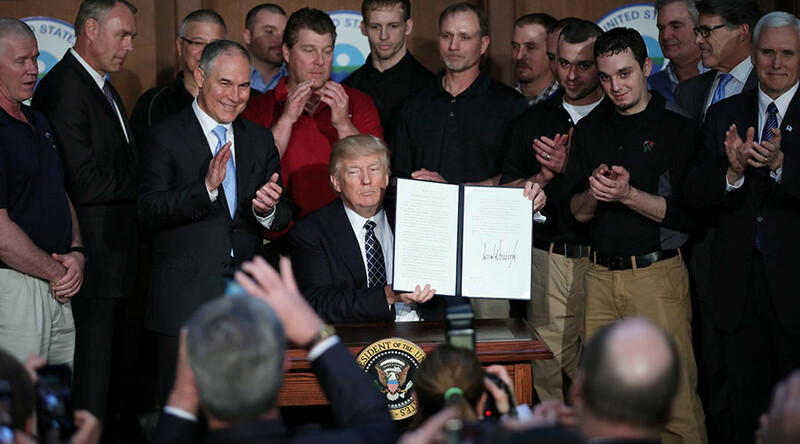 “I made my promise and I keep my promise,” he told a delegation of coal miners assembled behind him on the stage at the Environmental Protection Agency (EPA), before he signed the document. “We’re ending the theft of American prosperity and rebuilding our beloved country,” he announced, to applause. EPA chief Scott Pruitt, Interior Secretary Ryan Zinke, Energy Secretary Rick Perry and Vice President Mike Pence also spoke at the ceremony on Tuesday afternoon. “The war on coal is over,” Pence declared. Trump does not believe in manmade climate change, PBS reported, citing White House officials who briefed reporters on the upcoming executive measure. Tuesday’s order takes aim at the Obama administration’s Clean Power Plan, which placed carbon emission restrictions on coal power plants. It also lifts the moratorium on new coal exploration on federal lands, imposed by Obama in 2016, eliminates the language in federal regulations about the “social cost” of greenhouse gases, and revokes Obama’s executive orders treating climate change as a national security issue. Trump also intends to review regulations intended to reduce the methane emissions from oil and gas drilling, and the Bureau of Land Management’s rules on hydraulic fracturing, better known as fracking. While the US is still officially party to the Paris Agreement on man-made climate change, the Trump administration is discussing the possibility of withdrawing from the treaty, according to PBS.